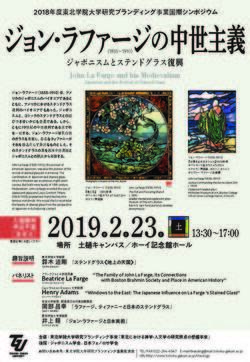 In addition to John La Farge there were several others connected to him or his extended family by blood or marriage who were artists or visited Japan. My talk attempts to show the relationship between these various families, focussing on figures who are less well-known than Matthew Calbraith Perry, Henry Adams and William Sturgis Bigelow. One of the first western artists to discover Japanese prints, John La Farge took Japanese ideas and used them to rethink the design principles of western art. A remarkable instance of this is his work in stained glass, where borrowing from the Japanese enabled him to completely transform and reinvent the medium.